"wheeeEEEK WHEEK WHEEK! Where are my treats?!" 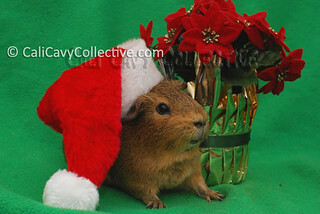 Belka finally decided she was willing to cooperate for some holiday pigtures (in exchange for lots of edibles, of course). Unlike her sister Truffle, she is quite an energetic and mischievous little agouti so she really made our humans work for the snapshots! Hey, whee never said that convincing us guinea pigs to pose for photos was easy hehe. 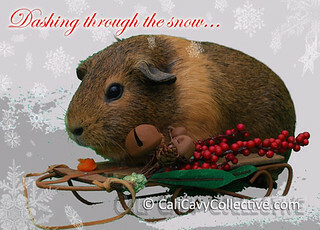 Dashing through the snow... on a one pig only sleigh, o'er the hills we go, wheeking all the way! Dashing throught the snopw... on a one pig only sleigh, o'er hills we go, wheeking all the way... wheeking is near by, piggies from town down jump really high, whee sing a cheerful song.. but the day is nearly gone, now I finish delivering gifts on my one pig only sleigh------------! I love that top hat! Thanks PaintedThread, it is actually a Christmas tree ornament that my humans spotted - they thought it was perfectly pig sized.